Tinkercad is a free, easy-to-use app for 3D design, electronics, and coding. It's used by teachers, kids, hobbyists, and designers to imagine, design, and make anything! Users can quickly learn how to use the Tinkercad software through basic tutorial lessons that focus on the basics of the Tinkercad tool. Additional lessons help users create artistic objects of increasing complexity by tinkering with existing designs, as well as to work collaboratively to create new designs. 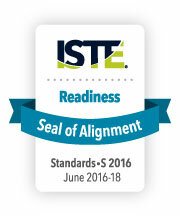 Autodesk’s Tinkercad successfully underwent the International Society for Technology in Education (ISTE) Seal of Alignment review for Readiness. Reviewers determined this resource helps build foundational technology skills needed to support the 2016 ISTE Standards for Students. Tinkercad is a browser based 3D design and modeling tool that is part of Autodesk’s 123D toolkit of free applications available online. The Tinkercad resource provides users with tutorials on how to use the tool as well as additional designs, lessons, and collaborative features to support the extended application of the tool. "The Tinkercad tool is easy-to-use, versatile and powerful. It lends itself to the creation of models, and the ability to use designs as input to 3D printers. 1.d. Students understand the fundamental concepts of technology operations, demonstrate the ability to choose, use and troubleshoot current technologies and are able to transfer their knowledge to explore emerging technologies. 4.a. Students know and use a deliberate design process for generating ideas, testing theories, creating innovative artifacts or solving authentic problems. 4.b. Students select and use digital tools to plan and manage a design process that considers design constraints and calculated risks. 4.c. Students develop, test and refine prototypes as part of a cyclical design process. 4.d. Students exhibit a tolerance for ambiguity, perseverance and the capacity to work with open-ended problems. 5.a. Students formulate problem definitions suited for technology-assisted methods such as data analysis, abstract models and algorithmic thinking in exploring and finding solutions. 5.b. Students break problems into component parts, extract key information, and develop descriptive models to understand complex systems or facilitate problem-solving. 6.a. Students choose the appropriate platforms and tools for meeting the desired objectives of their creation or communication. 6.b. Students create original works or responsibly repurpose or remix digital resources into new creations. This resource helps build foundational technology skills needed to support the 2016 ISTE Standards for Students.